*These articles are available from Hartford Institute's website. The Kingdom, The Power And the Glory - Scott Thumma's dissertation about one megachurch, Chapel Hill Harvester Church/Cathedral of the Holy Spirit, Earl Paulk former pastor. 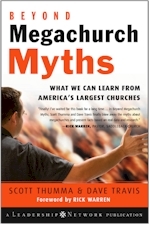 The dissertation traces the rise, growth and decline of one, atypical for sure, megachurch in detail. An Analysis of Rick Warren's 40 Days of Purpose Movement Written by Mike McMullen and William Kilgore, University of Houston-Clear Lake, this paper was presented at the Society for the Scientific Study of Religion in October of 2006. The Business of the Kingdom: Management guru Peter Drucker thinks the future of America is in the hands of churches. The Alpha and the Mega - A documentary film by Morgan Mead. How accurate are church counts? Here are three comments from Blogs on the topic. Response to the Smith article by Mark Kelly "If he had bothered to contact us first."